Description: The leaves are the most noteworthy portion of this modest, yet charming plant. The glossy appearance is from a sticky substance on the leaves, which traps unsuspecting insects and then the leaf enfolds and digests the insect. 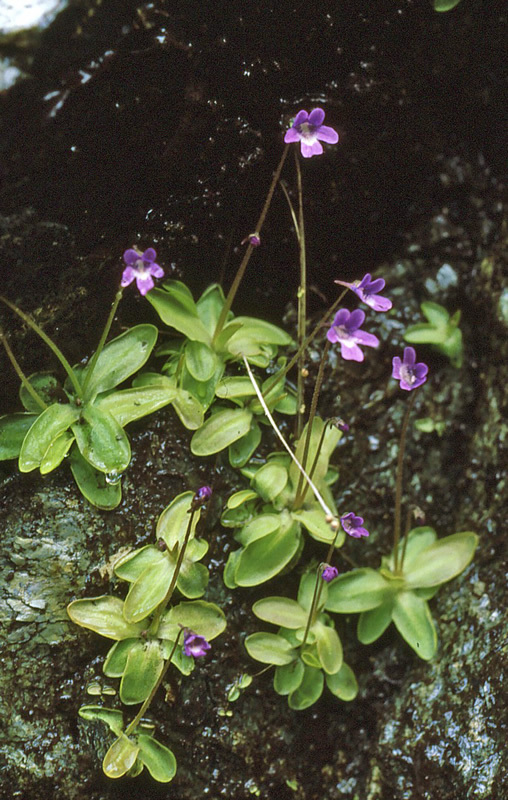 The Genus name Pinguicula means "little fat one" in Latin; this is because of the "fatty" glossy leaves. The common name Steepgrass originated in Europe (Ireland in particular), where it was steeped in Milk to curdle it. The name Valentine's Flower came from its use as a dream-enhancer. If you had someone in mind you would like to dream about, you could greatly improve your chances of seeing them in your dreams by putting a butterwort flower under your pillow.